As life becomes more digital, networking can feel increasingly awkward. Wait, can't we just text? As the founder of a digital dating consultancy, I know that relationship development really begins when you meet offline. To create meaningful connections, you need to put the phone down. Face-to-face is the new FaceTime. But even for me, saying hello at a networking event isn't always easy. Conversely, my husband has charisma in his DNA. He can walk into any room -- a conference, a club, a patio -- and make 100 best friends in one night. As an introvert, I make connections slower, differently, thriving on the one-on-one dynamic. It's what makes me a great dating coach. But when I attend conferences, finding meaningful connections, like the ones I have with my clients, can be challenging. 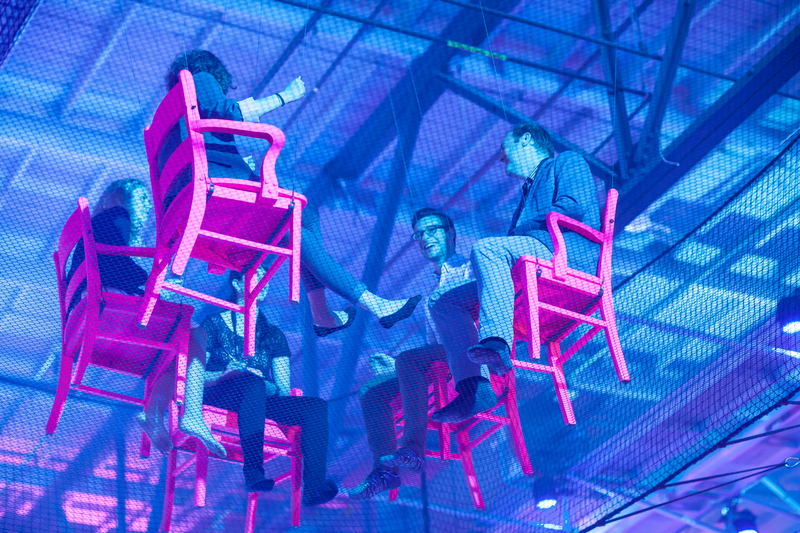 So when I heard that C2 Montreal, a business conference and festival of ideas, whose founding partner is Cirque de Soleil, had guided experiences and icebreakers to help you network, I hopped on a plane. I attended the conference alone, without my husband as my wingman. Usually this is stressful for me but at C2, it was empowering because the event is all about the face-to-face. I sat in a net, suspended 20 feet in the air over the crowds, and brainstormed for 20 minutes with five complete strangers. I went to a workshop on finding your next big idea, led by Philip Sheppard, an award-winning composer and producer, who made us sing, clap, and act goofy in small groups - again with complete strangers. And I had "brain dates" via E-180 -- 30-minute conversations with another person with the aim of learning from each other and discussing a specific topic. At C2, inspiration was reinvented -- and it was everywhere. Being in this environment inspired me to reinvent the way I networked. I shifted some of my usual habits and got creative with connecting. The result was network changing. Here are three tips taken from my networking playbook to help you work a room better, too. •	Befriend the well-connected: In Malcolm Gladwell's The Tipping Point, he explains the "Connector" - the person who knows everyone. The first day of C2, I met a person who perfectly fit this description. He knew everyone, encouraged me to hang out with him, and introduced me to new people throughout the day. The thing about Connectors is they love having an entourage. Later on, I ended up in Deloitte's private suite, shaking hands with two Vice Presidents who were enamored with my business. "I've been doing some research on the dating industry lately. I'd love your thoughts," one said. "I'm married but my friend needs your help," another explained as she pulled out her iPhone to email her girlfriend my contact info. Once you find a Connector, stay close. Make them your BFF. And give back to them as much as they did to you. •	Stop giving out business cards: At conferences, it's common to give out a lot of business cards but not hear from many of those people again. The connection with someone seems strong, but a lack of follow up can flat line the relationship. Even when you follow up, sometimes responses are low. When I forgot business cards my first day at C2, I started sending emails instead. "Give me your card and I'll send you a message right now," I said. I'd write a very quick message referencing something memorable about our connection. To my music partner in Phillip Sheppard's workshop, I wrote: "Nice to sing with you!" Before I left Montreal, my inbox was full of follow-ups with gestures of appreciation back, and the lines of communication opened. •	Be a free agent: It's often easier to strike up a conversation when someone is alone, rather than trying to approach a group of people who have a solidified dynamic. Being that one awkward person on the outskirts isn't fun! Instead, look for places where people linger solo, like the lunch line. At C2, I did this a lot at the Ferris Wheel, which was used for pitching. Make eye contact with the person next to you who is also alone and then comment with context. For example, you could ask if they had seen the keynote speaker that morning. Being one-on-one will give you the chance to really connect. Just as in dating, you often need to meet more people until you stumble upon The One - that perfect deal, referral partnership, or client for your business. Continue to develop your connections beyond the conference and it's more likely to turn into a relationship. Laurie Davis is the founder of the online dating concierge service, eFlirt, and the author of Love @ First Click: The Ultimate Guide to Online Dating. She is married to her tweetheart who she eFlirted with in 140 characters.